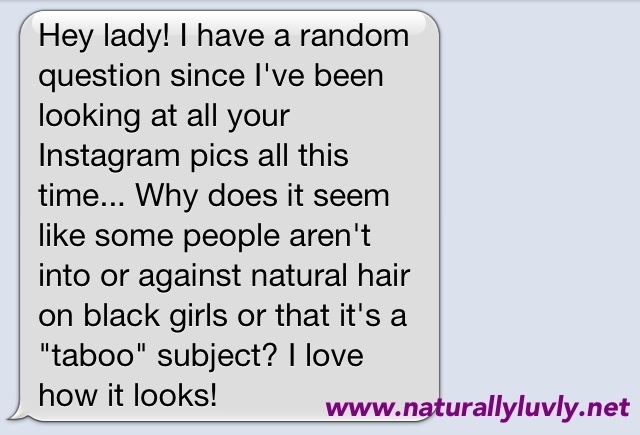 When Instagram sparks discussion on natural hair, I welcome it. I received this text a little while ago from someone who knew me back in high school. We were track buddies who recently reminisced on eating Doritos on the track together. She knew me back when I had a relaxer, but that has since changed. I'm now a natural hair blogger who showcases natural haired beauties on my social networks. If it wasn't for these social media platforms, I don't think we would have EVER had this conversation about natural hair. Just as The Natural Hair Street Exhibit: You Can Touch My Hair ruffled some feathers, I think she grasps the fact that many still don't accept natural hair and that some don't feel it should be talked about. 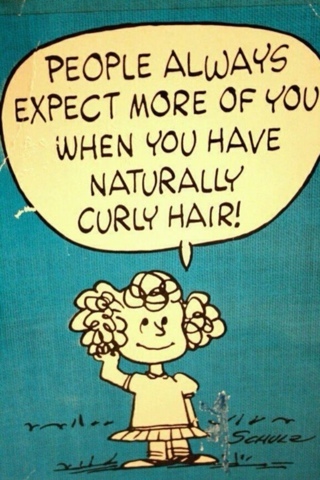 So "why does it seem like some people aren't into or against natural hair on black girls?" I'd like to hear responses from every race on this one because I'd like to know your perspectives on this question. Could it be the over saturation of straight hair on magazine covers? The fact that we don't see a natural haired woman at the anchor desk. My response to her was one that I felt experienced enough to express. I was once that girl that covered my natural hair and didn't view the new growth as something beautiful. I was a victim of assimilation. I just wanted to fit in with society too. I think because many Black girls at such a young age get relaxers that other races assume that our hair isn't "good hair". We spend so much money trying to convey our hair as something that it's not. My hair is not naturally straight and a relaxer isn't a permanent fix as you would have to keep relaxing to maintain that image. 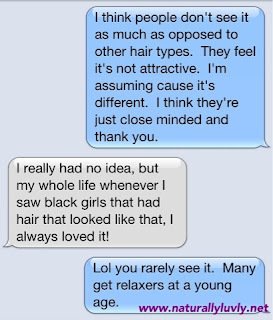 I never knew how much other races paid attention to our hair. 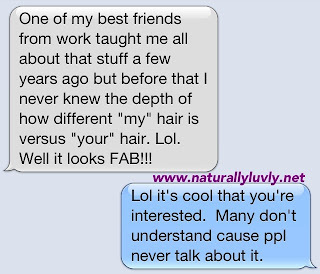 I never knew that she loved natural hair because it was different. We never had discussions of hair back in high school. 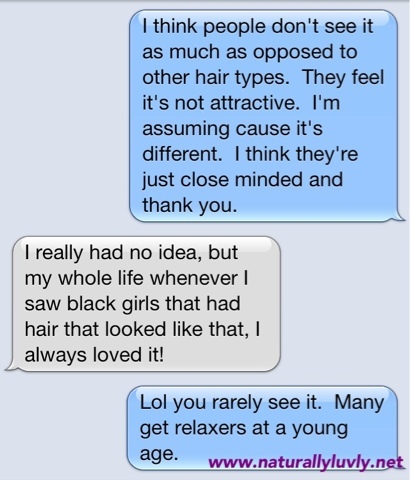 Maybe hair has always been a "taboo subject" in the Black community that she didn't want to go there. I don't know. It's something that I think should change. If someone is willing to learn, then teach. 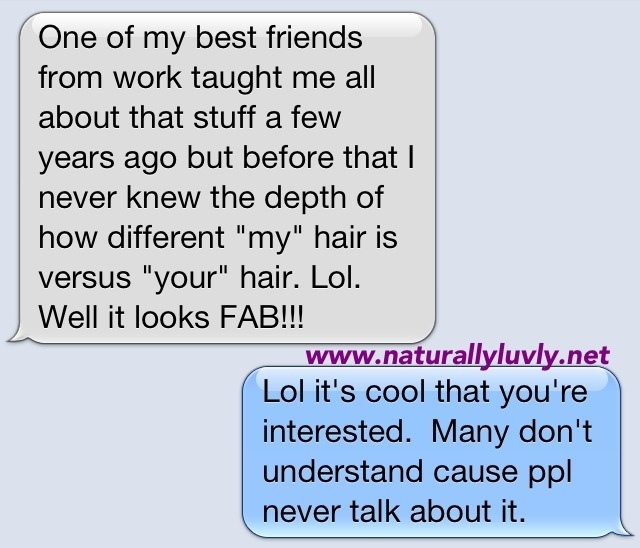 I love how much open she was to learning about natural hair. There was no judgment. Yes, there are differences between her hair and mine because we are of different races. Yet, she embraces the beauty of natural hair. Now, whenever she sees anything natural, she tends to think of me lol. Look at what she sent me a picture of below. What are you thoughts on our conversation? 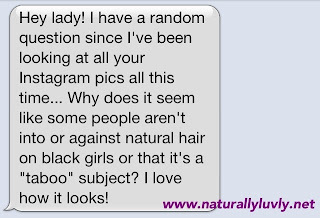 Do you think it's important to talk about natural hair or should this not be a topic of discussion? Post your thoughts below.